I have started this blog inspired by my friend of just over a decade, Jeannie Lee. I’ve been waving her away about it for years because of the time commitment: learning curves and then continuing to post. 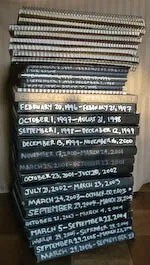 I’d already stopped writing in my precious journals in favor of a voice recorder because of how much time it took. I already have plenty of ways to keep myself a little too busy: university, learning to dance, making money, reading, writing music, keeping up with friends and family…. Jeannie’s rebuttal was that I could put as little time as I felt like into the project, which is true, of course, but not usually how I operate. I think two things tipped me. One is that I’ve been thinking a lot about how difficult it is for me to write well, and that it’s because of how difficult it is for me to think clearly. But good, clear thinking is important to me. I decided I could stand to nudge my daily activities in that direction. Another push was from my new friend, Reanna, who told me she liked the little rants I’d put up on my (feeble) myspace page. She’s smart and a writer and I have a crush on her, so that convinced me to make better friends with the part of myself that says things. Plus, the few writings and images she has up online give a sense of her personality and life that mine do not. I’m jealous. So here it is, starting September 29, 2008, the first day of my 38th year. I’m calling it Nathen’s Miraculous Escape after a zine that I made for a while about my year, each year, for Christmas presents. (I stole the name from the title my dad gave to the film of my brother Ely’s birth: Ely’s Miraculous Escape.) I hope this blog will serve the same purpose as the zine—make it easier for you to stay connected with me during the times (most of the time, actually) that I’m working on projects and neglecting the loved ones in my life who I don’t see every day. I’m excited about this project. I always get a creative rush around this time because I always spend a lot of time brainstorming about my new year, clarifying my goals and visions. This year’s creative rush has been bigger than usual, though. The last several days I’ve woken up after only a few hours of sleep and lain awake until morning, thinking about how to organize this page, how I can include all of my inspirations. Normally I’m not a big fan of insomnia, but this has been fun. I hope you enjoy it.